There was a considerable amount of hype when the HTC One (M8) first came in the market, sometime early this year. The smartphone received rave reviews, and it was difficult even for the cynical to argue otherwise because the M8 was among the better performing smartphones at that time. However, this time round HTC has had a shot at something bigger and better. To say that the Taiwanese phone brand accomplished in doing so would be an overstatement, but one has to admit that the smart device ticks quite a few boxes. Priced at Rs. 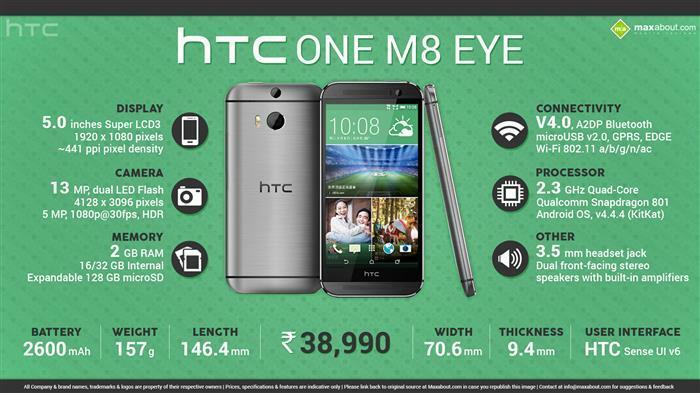 38,990 the M8 Eye is a smart device with smarter looks. Here is a low down of the device and what makes it talked about. The HTC One (M8 Eye) is as stylishly snazzy in the looks department, as its predecessor. With a five-inch screen and a high-definition resolution of 1080x1920 pixels it offers a sharp and clear display. Weighing a mere 157g this new baby from the HTC stable is not large. An aluminium body gives it a nice glossy finish, which enhances the look and feel of the M8 eye, which is a good thing. The problem is that it is too glossy for easy handling it does tend to slip easily. That being said the M8 eye is definitely a phone with killer looks (if that can be said for a phone). The phone comes in three colour variants, each as cool as the other – amber gold, gunmetal grey and glacial silver. This smart device is powered by a 2.3GHz quad-core Qualcomm Snapdragon 801 processor chip, and a 2GB RAM Memory in addition to the 16/32 GB Internal memory and Expandable 128 GB microSD. It uses the Android v4.4.4 KitKat OS and also features the innovative HTC Sense 6. While the apps operate efficiently, the phone's gaming experience is actually quite satisfying. The best part is that videos can be played without a hitch. The M8 has BlinkFeed, which is a content feed calculated to lay special emphasis on news stories and social media – as the default setting on the home screen. The M8 eye's audio quality is clear, especially through earphones. Additionally, the BoomSound speakers present an amazing sound experience. It comes with a 2,600 mAh non-removable battery, which when fully charged, can run for an incredible 12-14 hours. The 13-megapixel (MP) rear dual-lens camera with LED Flash in the M8 Eye is perhaps its most notable attribute, with advanced features that include Photo booth, Split capture and Crop-me-in. There is a 5 MP front camera as well. The camera works wonderfully under normal light conditions, and the pictures are sharp, however the pictures are not that striking when the lighting is poor. But, if you like clicking selfies then, the front camera certainly does a good job. Further, the phone also supports the HTC Eye Experience; which is an HTC proprietary software that allows users to make the most effective use of the phone's camera. The One M8 was indubitably an outstanding phone, but what places the M8 Eye a notch higher is the superiority of the camera (the previous model had just a four-ultrapixel camera). With the One M8 Eye, HTC has enhanced a creation that was already outstanding. competition. The Moto X (second generation) and the Samsung Galaxy S5 are available in the same price range and pose stiff competition to the HTC M8.